Vocalist Leah Stillwell is having a release party for her new CD, “So This Is Love,” at the Triple Door Musicquarium on Thursday, January 31. From her website: Leah is influenced by the greats and fell in love with jazz immediately once introduced as a teen to the satin melodies of classics like Ella Fitzgerald, Sarah Vaughan and Billie Holiday. Her vocal style is a personal amalgamation of the old standards along with any and all other music that has ever appealed to ear, heart and soul. Born and raised in Western Washington, Leah is influenced and inspired by the diverse flavors and talents of the local jazz community. She is proud to be establishing herself in the area and is eager to build her name and reputation. With a fresh new approach to a classic art form, Leah gracefully captures the style and charisma of jazz with her sultry voice and laid back expression. 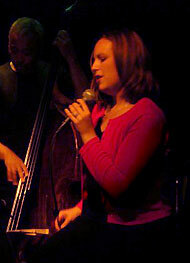 Calm and alluring, her tunes will relax you into the finest essence of vocal jazz.